Human and animal remains which may date back to the Iron Age have been found by workmen laying the foundations of a school in south London. The remains, which could be more than 2,000 years old, were found at the site for the new Stanley Park High School in Orchard Hill, Carshalton, in Sutton. Skeletons of children and dismembered farm animals, which appear to have been sacrificed, were found in deep pits. 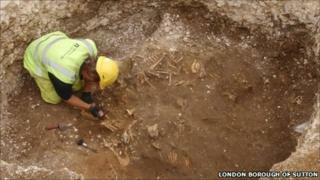 The remains may be from late Iron Age or early Roman era, an expert said. The site, where Queen Mary's Hospital was located, is less than 100m (328ft) away from a hilltop where late Bronze Age remains were discovered in the early 20th Century. Duncan Hawkins, the lead archaeological consultant, said the findings were "typical of a late Iron Age and early Roman farming settlement". "A very large number of domestic animal skeletons have been recovered - including horses, cattle, pigs, sheep, goats and dogs. "These animals which were either whole or partly dismembered appear to have been deliberately sacrificed and deposited in deep (up to 4m) pits cut into the chalk bed rock. "This may represent some form of 'closure' ritual when the settlement passed out of use with the pits perhaps originally representing grain stores," he added. Councillor Graham Tope, executive member for community safety, leisure and libraries at Sutton Council, said: "Archaeologists tell us these excavations are certainly the most important ever undertaken in the London Borough of Sutton and very important in the context of Greater London where much of other evidence of these periods has been destroyed by earlier development. "It will really help to bring ancient history to life for local children when they attend their new school." Building work is continuing at the site.